What Are ComponentAdapters and why are they useful? ComponentAdapters are probably PicoContainer’s most highly misunderstood (and coincidentally, most powerful) feature. They combine the power of an object factory, and an object interceptor rolled into one. In essence, the sole purpose of the ComponentAdapter is to provide a PicoContainer with an actual object instance. In fact, DefaultPicoContainer does not contain a Map of Classes, a Map of object Instances, or anything like that. Instead it contains a map of ComponentAdapters . Each time you use addComponent(..) on PicoContainer, behind the scenes a new ComponentAdapter instance is set up. There is one ComponentAdapter implementation per component instance. The ComponentAdapters can be added to a container directly, or made by the ComponentFactory the container is using. Both for BehaviorFactory and InjectionFactory implementations. Its all hidden from you to make PicoContainer’s API appear simple. So what happens when PicoContainer.getComponent() is called? 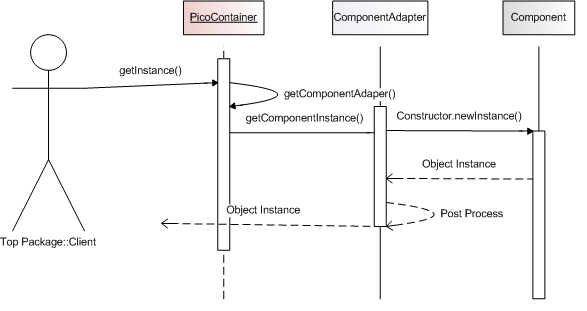 Our goal with this sequence diagram is to show that the primary function of PicoContainer here is to locate the ComponentAdapter that has been previously registered via MutablePicoContainer .addComponent() or MutablePicoContainer.addAdapter(). Once PicoContainer locates the appropriate ComponentAdapter, it calls the fabled ComponentAdapter.getComponentInstance() . A very simple ComponentAdapter could merely call Class.newInstance() on the type of the component being instantiated. Of course, PicoContainer may be small, but it is hardly simple! That whenever you call addComponent(), Pico, behind the scenes, is wrapping MyObject.class with a ConstructorInjector ComponentAdapter. When you call Pico.getComponent(), PicoContainer calls the ConstructorInjector, which in turns, uses ConstructorInjection to create the MyObject instance. Post Instantiation Modification using Behaviors . If the only job of a ComponentAdapter was to construct an object, we would probably call it a ComponentFactory and be done with it. However, as you are most assuredly an astute reader, you can clearly tell that since there is more scrollbar left on your browser…. there is more to this story. You see, ComponentAdapters were meant to be chained together using the Decorator pattern. It is this chaining that allows for the “Post Processing” step that is listed on the sequence diagram. There are many things that can be done to an object once it is created. For example, maybe you don’t want a new object instance to be created each and every time you call PicoContainer.getInstance(). Perhaps you want an object to be stateless and shared across multiple objects? (The Spring Framework, and Guice calls this behavior Singleton). With an adapter chain like this, the first time PicoContainer.getInstance() is called, Caching would pass the request down to ConstructorInjector. Once it receives the instance returned back, it would store that instance for future calls and return that instance back to the caller. Upon future calls, Caching would return its own cached instance. (Thus the name Caching ComponentAdapter instead of SingletonComponentAdapter). Of course, other storage options are possible: HttpSession, ThreadLocal, etc. Also keep in mind that behaviors are not limited to how an object is stored. For example HiddenImplementation wraps the instantiated component in a dynamic proxy, thereby enforcing that receiver of that component cannot cast the received interface into an implementation. PicoContainer 2.0 has provided a Builder class series to help define which ComponentAdapter to use with a given container by default. There are different builders with each subproject. So PicoContainer has PicoBuilder , PicoContainer-Gems has PicoGemsBuilder , and so on. For the purpose of clarity, we will only use PicoBuilder in this document. In both of these Examples, ConstructorInjection is automatically used by default. Since there is one ComponentAdapter chain per registration in a mutable PicoContainer, there needs to be an object that creates a ComponentAdapter every time MutablePicoContainer.addComponent() is called. Thus enters the ComponentFactories. (Each ComponentFactory creates ComponentAdapter). Changing the default ComponentAdapter when registering objects. As each ComponentAdapter implementation only does one specific job, you can see that it is quite simple, but the range of possibilities are endless.